Prunus subspecies (Rosaceae). Cherries are grown extensively in Europe and in suitable areas of many other countries including Australia, New Zealand, South Africa, the US, China, Japan and Chile. Two Species, Prunus avium and Prunus cerasus, are the forebears of today’s cherries (Prunus avium of the sweet cherries, Prunus cerasus of the acid cherries) and the Duke cherries arise from hybridisation between the two. Prunus avium is widespread in Britain, Europe and parts of Western Asia; its seedlings, often known as ‘geans’ or ‘mazzards’, grow into large upright trees often exceeding 18m in height. Prunus cerasus is of much smaller stature, of rounded, spreading habit and some 4m in height; it is also indigenous to Britain, the southeasterly regions of Europe and western Asia, and extends into parts of Scandinavia. Other species producing edible fruits are Prunus pseudocerasus, the Chinese early cherry, Prunus tomentosa, and Prunus besseyi, the western sand cherry, native to North America. 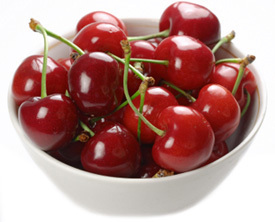 Cherries are known to have been cultivated in Asia Minor as early as 800BC, and later in Greece. Wild cherries had been used as food long before, and as excavations at some Bronze and Iron Age sites in Britain indicate. Later, indigenous forms were complemented by cherry samples imported by the Roman legions, cherry stones having been found at a number of Roman sites. In the early Medieval period there are occasional references to the cherry, and to its cultivation in Kent. From the 16th century cherry-growing flourished here, largely for supplying London, and new cultivars were introduced from the continent. By the beginning of the 19th century Thomas Andrew Knight included cherries in his classic fruit-breeding work and fine cultivars such as ‘Knight’s Early Black’ and ‘Elton Heart’, two of his introductions, are still available. In 1827 the Horticultural Society included 246 cherries in its fruit summaries, but only a few were in widespread cultivation and the list included many synonyms. ‘Bigarreau Napoleon’, a cultivar still extensively grown, was introduced from Germany in 1832, but its exact origin remains obscure. The Nurseryman Thomas Rivers included cherries in his breeding programme and ‘Early Rivers’ was released in 1872. After World War I the John Innes Horticultural Institute lauched a major long-term cherry-breeding programme, culminating in the introduction of a number of valuable cultivars such as ‘Merton Glory’, ‘Merton Bigarreau’ and ‘Merton Heart’ and, in the 1970s. ‘Merchant’, ‘Mermat’ and ‘Merpet’. In North America, new cultivars were raised in the 19th century, ‘Grosvenor Wood’ among them. Much later, at Summerland, British Columbia, the breeding of the first self-fertile sweet cherry, ‘Stella’, was accomplished. More recently two other self-fertile cultivars have been released from the same centre – ‘Lapins’ and ‘Sunburst’. Before their introduction at least two trees of different cultivars were essential. For the average-sized gardens, the sweet cherry is generally unsuitable unless adequate wall space is available to facilitate netting the crop against birds. Although it is now possible to grow a moderate-sized tree, using ‘Colt’ rootstock, trees are still large and take up a great deal of space. The acid cherries, however, are a distinct possiblity, either fan-trained or as a bush where gardens lack adequate space. A much smaller tree, the self-fertile ‘Morello’ is the most successful and this and other acid cultivars often do well on north-facing or east-facing walls in cool temperate regions, given reasonable soil. 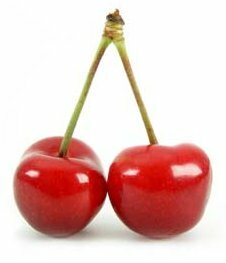 Cherries flower later than other stone fruits and are therefore less vulnerable to damage from spring frosts. Suitable soil is important and the best cherry-growing areas in Britain are on the deep brick earths in Kent. Good soil depth will allow satisfactory results on many soils. Sands, gravels and shallow soils inhibit steady growth due to lack of nutrients and moisture. Conversely the trees will not tolerate wet waterlogged soil. A pH of 6.5-6.8 is ideal. In Britain, a combination of tree-size and climate encourages bacterial canker, which has caused commercial cherry-growing to decline markedly since World War II. The cost of labour to protect the crop from birds and to pick it from large trees became prohibitive. The development of dwarfing rootstocks could greatly change the situation. 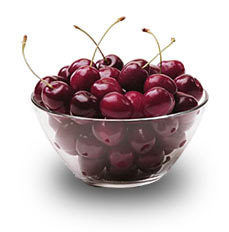 In the US few cherries are grown in the harsh climate of the far northern states. In Australia the high chilling requirement of cherry trees restricts their profitable cultivation to regions with colder winters. A predominently dry climate at the time of fruit ripening is all-important to avoid severe loss of crop from split fruits. Traditionally, rootstocks for cherries were the ‘geans’ or ‘mazzards’ – wild seedlings of Prunus avium – collected from the woods. Then, as with rootstocks for other tree fruits, research by Hatton at East Malling Research Station in Kent offered a superior clonal selection of Prunus avium known as F12/1. This rootstock was widely used for much of the 20th century, but futher work at East Malling produced ‘Colt’, a rather less vigorous (but not dwarfing) rootstock, a hybrid from Prunus avium and Prunus pseudocerasus (the Chinese Early Cherry). ‘Colt’, is now firmly established but even so trees on it are still large and a truly dwarfing rootstock is not yet available, although some from Belgium are under trial. In the past Prunus mahaleb has been tried out with mixed success. In Australia it has been found to be better than F12/1 for drier areas, although it is not fully compatible with a few cultivars. In the US selected seedlings of Prunus avium are preferred. A wide choice of cultivars exist, all ripening during the early to high summer period. Fruit colour ranges from creamy white, sometimes with a pink flush, through red to deepest purple-black depending on the cultivar. In Britain, the most popular sweet cherries include ‘Moreton Biggereau’, ‘Merton Glory’, ‘Napoleon Biggereau’ and ‘Stella’. The recent introductions from the John Innes Institute, ‘Mermat’ and ‘Merchant’ along with ‘Merton Glory’, ‘Stella’ and ‘Van’, an American introduction, are among the most suitable for commercial production, particularly since the first two show some resistence to bacterial canker. Other long-established quality cultivars, such as ‘Early Rivers’, ‘Waterloo’, ‘Roundel’ and ‘Bradbourne Black’, are occasionally listed. Of the acid cultivars, ‘Morello’ is by far the most popular. In the US the major production areas are California, Oregon and Washington, with ‘Bing’ and ‘Lambert’ being predominent cultivars. The acid ‘Montmorency’ is grown largely in Michigan. In Australia and New Zealand there is a wide choice of cultivars: ‘Burgsdorf’ is a very reliable early black cherry and ‘Early Rivers’, ‘Stella’ and ‘Van’ are also among those recommended. Until recently, no sweet cherry was self-fertile and even now ‘Stella’, ‘Lapins’ and ‘Sunburst’ are the only self-fertile cultivars available. 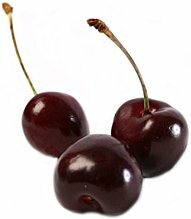 These three apart, the pollination requirements for other sweet cherries are highly complex. In summary the cultivars fall into identified groups and all cultivars within these groups are cross-compatible one with the other. Pairings therefore not only have to flower at the same time but also come from different groups. A few cultivars are termed universal donors and can be paired with any other with a corresponding flowering period. The acid and Duke cherries (the latter being the hybrid Prunus x goudouinii) also are largely self-incompatible or at least partly so, but ‘Morello’, ‘Montmorency’ and ‘Flemish Red’ of the acid cherries, and ‘Ronald’s Late Duke’ of the Duke types are all self-fertile. There are, however, no incompatibility groupings comparable to sweet cherries; also the acid and Duke cultivars are capable of pollinating sweet cherries but flower rather too late for this purpose. Fruit colour is invariably red to purple-black depending on cultivar. Planting can be done at any time during the winter but trees planted late may be checked if soil moisture is lacking. Where dry conditions prevail, some irrigation at and following planting may be necessary, supplemented by mulching. Weed control is essential at all times, either by cultivation or herbicides, but use of the latter calls for caution since use of the wrong chemicals can cause serious damage especially to young trees. In Britain and other areas with similar climate, a grass sward assists access and gives some competition to the naturally vigorous tree growth, the grass being mown regularly. Planting an orchard will require tree spacings of the order of 6-8m apart on ‘Colt’ rootstock, 10-12m on F12/1 and Prunus avium seedlings, the larger distances for the more vigorous cultivars; sometimes plums or cobnuts are used as a temporary inter-crop. Some support for the trees may be necessary initially, but once established trees should readily support themselves. For cropping trees in dry climates, irrigation will be necessary, not least after the crop has been gathered to assist flower-bud formation. Watering as fruit is ripening encourages split fruits and should be withheld, but in cool temperate areas wall-trained trees may require watering in dry seasons. Tree types used are the vase or goblet-shaped bush, the trained fan, or a more loosely grown form of it such as the palmette and variations used in Australia. The standard or half-standard, at one time favoured to allow cattle and sheep to graze the orchard, are no longer in favour, smaller bush trees easing management problems. A bush is trained as for a bush plum and with the same timing. Within three years the main branch framework should have been formed, if care is taken to avoid creating narrow angles between branches in the process which would be predisposed to breakage under the weight of the crop. The formation of a fan-trained tree is again as for the plum. The palmette is a much more loosely trained tree with a less precise fan shape and branch formation. Once bush trees have been formed and are cropping, sweet cherries should be pruned in summer, after the crop has been gathered, to reduce the risk of bacterial canker or silver leaf infection. Cutting is kept to a minimum, merely removing low, crowded, crossing, diseased or broken branches. All larger wounds should be treated immediatley with a sealant against silver leaf and bacterial canker. Fan-trained trees of sweet cherry will require side shoots being pinched at 5-6 leaves, these shoots being shortened to three leaves in late summer. Any badly placed shoots should be removed completely. Pruning of cropping acid cherries calls for a different technique, since fruit is carried almost exclusively on young shoots of the previous year. Hence, a continual replacement system is required. On the bush in spring a proportion of existing older shoots, even branches, must be cut back to a visible growth bud for the renewal of young growth; thus in three or four years the whole tree can be rejuvenated. Similarly with the fan older shoots must be shortened to an active bud which should then form the replacement shoot; these are left full length, i.e. not pinched, and will fruit in the year following. Equally, some shoots that have carried fruit can be cut back to young replacement shoots once picking is complete. Nutrition requires careful management. Nitrogen may be required but not on over-vigorous trees. Since potash is also important, the application of a compound fertiliser high in potash, at 75g/m², should be given in early spring where necessary. Acid cherries may require rather higher rates, particularly rather more nitrogen content to induce adequate replacement growth. Picking the ripe fruit with stalk intact is desirable for dessert samples; acid cherries are best gathered by cutting through the stalks with scissors. Commercially some crops destined for processing are machine-harvested. Propagation is by budding. Young leaves and shoots of fruiting and ornamental cherries are frequently infested by aphids of the cherry blackfly (Myzus cerasi); leaves become distorted, growth checked and foliage fouled with sticky honey dew and sooty moulds. Prunus avium and Prunus cerasus are particularly susceptible. Tar oil winter washes will kill overwintering eggs and spring infestations may be controlled with contact or systemic insecticides. Cherries may be attacked by the caterpillars of several moths including several subspecies of winter moths, magpie moth (Abraxus grossulariata), vapourer moth (Orgyia antiqua), grey dagger moth (Acronicta psi), fruit tree tortrix moth (several subspecies) and leopard moth (Zeuzera pyrina). Leaves may also become invaded by leaf weevils (Phyllobius subspecies) and larvae of the pear and cherry slugworm (Caliroa cerasi). Occasionally woody stems, shoots and leaves may become infested with brown scale (Partenolecanium corni). In parts of Europe (not the UK) and North America the fruits may be seriously damaged by the cherry fruit flies (Rhagoletis subspecies). Other pests of fruiting cherries in North America include the caterpillars of the cherry fruit worm (Grapholitha packardi), which bore into green cherry fruits, and the larvae of the cherry fruit sawfly (Hoplocampa cookei), which attack fruit in the immediate post-blossom period. Cherries can be affected by armillaria root rot (Armillaria subspecies), bacterial canker (Pseudomonas mors-prunorum), bitter rot (Glomerella cingulata), brown rot (Sclerotinia fructigena), crown gall (Agrobacterium tumefaciens), leaf curl (Taphrina minor), powdery mildew (Podosphaera tridactyla), scab (Venturia cerasi), shot hole (Stigmina carpophila), silver leaf (Chrondostereum purpureum) and witches’ broom (Taphrina cerasi). The fungus Gnomonia erythrostoma causes a common disease popularly known as leaf scorch because of the appearance of the leaves. It also destroys the abscission layers of the leaves so that they remain attached throughout the winter. These leaves should be stripped off and burnt and the young leaves sprayed with a protectant fungicide in the spring. Very many viruses as well as the Little Cherry mycoplasma can affect cherries and although important in commercial production they are not likely to be so in gardens. When new cherries are planted on land where cherries have grown previously the new plants may have a reduced root system resulting in poor growth and cropping. This so-called specific cherry replant disease is caused by the fungus Thielaviopsis basicola. The problem can be overcome by soil fumigation.